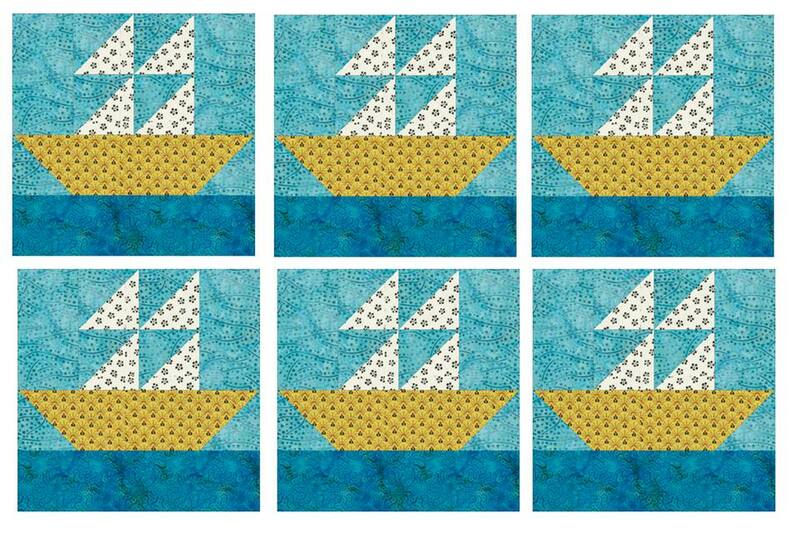 The boats in this 12-inch sailboats quilt block pattern sit on a wide bar of water. A single sky fabric is sewn behind the remaining patchwork. The quilt block is easy to make, and a breeze for quilters of all skill levels. You'll find cutting instructions for one sailboats quilt block at the bottom of the page. Making single blocks is perfect if you're designing a scrap quilt with lots of boat variations. You might also opt to combine this sailboats design with boats that sit at the bottom of the block. Gather the 3-7/8" squares cut from sail and sky fabrics. Draw a diagonal line on the reverse side of the two lightest squares. Pair a sky square with a sail square. Use an easy quick piecing method to turn the pair into two half square triangle units that measure 3-1/2" x 3-1/2". Repeat to make two more units. If units are too small, try cutting your squares larger than necessary for the next block, and then trim finished units back to the exact size. Instructions are on the last page of the tutorial linked above. Referring to the diagram, sew the four sail units into two rows as shown, middle left. Press seam allowances in adjoining rows in opposite directions and then join the rows. Press. Sew a 3-1/2" x 6-1/2" sky rectangle to each side of the sails unit as shown, middle right. Press seam allowances towards the sky. Gather the 3-1/2" x 12-1/2" boat bar and the (2) 3-1/2" x 3-1/2" sky squares. Draw a diagonal line from one corner to the opposite corner on the reverse side of each sly square. Use the quick pieced flying geese method to sew a square to each end of the bar. Sew the 3-1/2" x 12-1/2" water bar to the bottom of the boat unit, as shown in the bottom row of the illustration. Press seam allowances towards the water. Join the boat/water unit and the sails/sky unit to complete the quilt block. Press the Sailboat quilt block. The block should measure 12-1/2" x 12-1/2". Make additional blocks as needed.